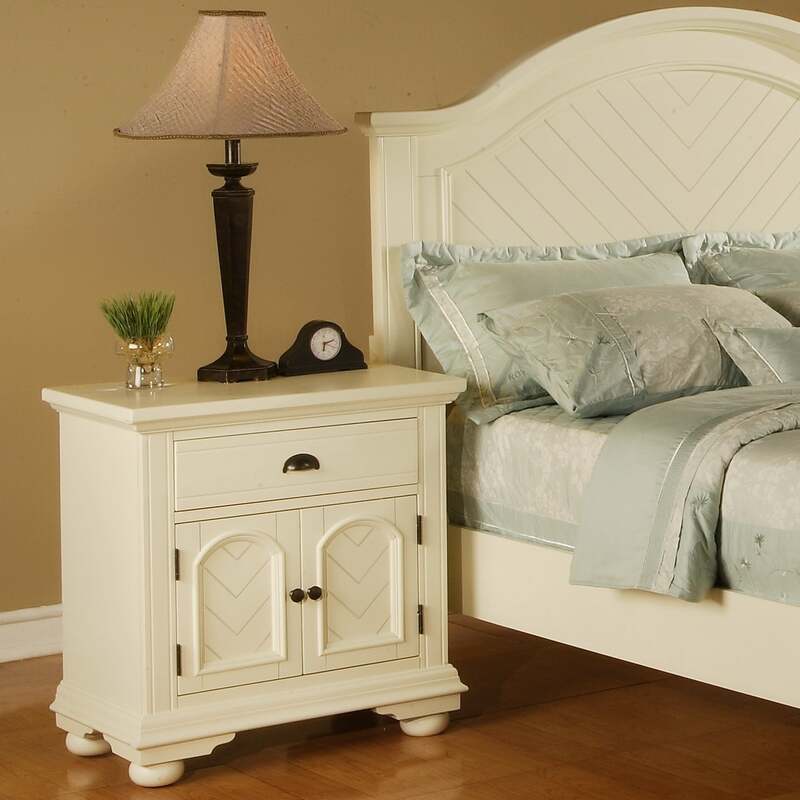 Store your most treasured items right at your bedside with this unique white nightstand from Napa. Effortlessly complement the decor in your home with a cottage antique white finish that coordinates with many color schemes. Antiqued pewter pulls and knobs further enhance the look of this sophisticated nightstand. Hardwood and MDF construction make this bedroom piece sturdy and long-lasting. A spacious drawer, along with two doors that open up for more capacity, accommodate your storage needs. Wood-on-wood drawers glide effortlessly, while built-in safety stops allow ease of use. Dust-proofing under the bottom drawers provides extra protection. I purchased 2 of these nightstands after searching high and low for something made of WOOD, (not partical board) that wouldn't break the bank. They are large, heavy, quality wood stands. The color is accurately described. The only complaint is that the drawer on one of them was not put together properly and there is no way to take it out..my husband has 'fixed' it, but, we're not sure why this would have passed inspection by the manufacturer..these are made in Vietnam..would have preferred to purchase something made in the USA. Overall happy with the purchase. The nightstand was damaged when I received it even though it appeared to be packaged well. I called customer service and the rep asked that I repackage the item and take it to the UPS store. I told the rep that the item is fully assembled and quite heavy. Plus, I didn't have a box large enough to fit a nightstand - the original box was not useable. He then offered to ship another nightstand at no charge and to file a damaged-in-transit claim with UPS. I received another nightstand, but didn't open it right away because we were in the midst of a move. I finally opened the box a few weeks ago and found the drawer in pieces and the top side deeply scratched. What are the chances of getting two damaged nightstands? Don't think I will be ordering furniture from Overstock again even though I have my eye on a few of things. It's too much trouble to return large items. UPS never came to investigate the claim. I have never ordered furniture online, unseen before but I was very impressed with the quality, color and design. I have been driving around looking at furniture stores but could not find exactly what I wanted. These night stands are slightly taller and that is a plus. I like the one drawer and openness of the bottom compartment as I have several books and magazines I keep there. I was also very impressed with the shipping and delivery of the product. It came un-damaged and in a timely manner. I will definitely order furniture again from Overstock.com. Liked it so much ordered another. They do store the legs in the top drawer, so first one arrived with a bit of damage to the drawer but nothing that could not be fixed. Second one arrived without the damage to the drawer but a small chip, also can be fixed with a tap of touch up paint. The doors that open do not have a shelf it is open to store blankets or whatever, a nice space, and, the drawer on the top is a nice space also with an easy sliding drawer. Overall, I would recommend this it is sturdy and a piece you will be able to enjoy for the years to come. As mentioned, the nightstand is a solid and beautiful piece of furniture, but whoever packaged this item had no regard for the person trying to open and use the drawer. The drawer had the four wooden pedestal feet enclosed in a box way too big for the drawer. The drawer was impossible to open because of the box and then very messy Styrofoam was also engaged everywhere in the drawer. We both hurt our hands trying to get all this packaging out of the drawer. Due to the extreme pressure that we had to apply to get the packaging out of the drawer, the inside of the drawer cracked and it took us hours to clean up the Styrofoam mess from our bedroom. I have pictures if anyone wants to see what we had to deal with. This was a distressing experience. Overstock customer service was responsive, concerned and gracious. I love this nightstand. The nightstand and chest are in a guest bedroom. It has a drawer and then opens for storage on the bottom half. White color with antique bronze/black fixtures. I love it. I was looking for an off-white nightstand to match a metal bed. From the other reviews I knew it was antique white, not white as stated in the title. This nightstand is nice for the money. Mine arrived with a crack in the paint in the right rear corner of the top, which appears to cover a crack in the MDF top itself, as though something heavy had been set on that corner before it was painted. Since it is near the back, it isn't noticeable after I placed a lamp and other things on the table. There are other minor flaws in the paint on one side they are not visible in the room. It's still better-built than anything you could find for the same price in a furniture store. Very easy to assemble; the sturdy bun-style legs simply had to be screwed on. They were packed inside the drawer, and this fact was well-marked on the packaging. I must have rec'd Wednesday1965's return!! The first nightstand I rec'd was damaged at the factory. The drawer was stuck on the diagonal w/the box the came in cramed into the drawer, plus dent on the front edge of the top. Also, the stablier for the drawer was cracked and only one screw had been installed, when I finally dislodged the drawer found the other screw which belong at the end of the stabilizer.There was no visable damage to the carton or the packaging. The O's CS was excellent and sent out a replacement ASAP. In the meantime the dresser was delivered and I was very leary of even opening it, but it was in excellent shape. The replacement nightstand arrived in excellent condition also. Someone at the factory was not having a good day to shove that drawer in like that. I am really impressed by the quality of this nightstand. It is heavy and came fully assembled. The color has a very slightly creamy touch but still goes well with our white bed. I looked at a lot of nightstands. These arrived quickly, and look great. The only drawback was they were left at my front door and had to be carried upstairs--they are really heavy-- whereas my other bedroom furniture from Overstock was brought by truck and brought up to the room. One of the nightstands had a trim piece that did not fit well in one corner. But overall they look great, and certainly for the price they are excellent. They are packed really well, had no damage. I have not put the legs on yet, and may not as they look great without them. The legs are packed inside the drawers as other reviews say but if you get the styrofoam out first, the box with the legs will come out without too much difficulty. The drawer pulls are not "antique pewter" unless you call that bronze. The hardware is all dark brown not silver-- but it looks great. I am very happy with these nightstands. the small tacks /staples almost missed the wood in the back of the drawer. the heavy hardware box was put in the thin drawer. the right rear of the drawer is separated/broken apart and the drawer does not come all the way out. we are going to try to fix it because i dont want the hassle of returning it, although we might have to return it. Ordered two, shipped on time and packaging was excellent. No damage to either night stand. We love them! My only "complaint" is that the legs are "stuffed" into the drawer, making them difficult to remove. This actually cause one drawer, which had not been glued, to partially separate on one side. My husband was able to fix this using furniture glue. The night stands are beautiful, roomy and everything I wanted. I was so please with the quality, and beauty of the nightstand. The price was reasonable for the quality and rich look, I feel that I have made a good investment. Got this nightstand and the large dresser for daughter's apartment. Very pleased with the quality as well as the look. Pretty pieces with great details that give them an expensive look.. This is a very good quality line of bedroom furniture for the price. Love this bedroom suite. Couldnt be happier with it. Thanks to overstock! Sleak look and nice surfaces, however they can stain. The inside of the drawer is hard to clean as it is rough. These nightstands went to our beach house. The proportions look wonderful beside the king sized bed. The structure looks and is very sturdy. The storage size is very convenient to hold extra sheets, boxes of tissue and books. The finish on top needs to be protected from drink glasses. The color and stressed finish look very inviting. Good choice, these. Beautiful Nightstands!!! They look great and have so much storage. I also bought the dresser and mirror. So pleased with the entire set! Thanks Overstock! This piece is really well made. I’ve had it a few years now and it’s a solid piece of furniture that is holding up beautifuly. I’m so glad a got it. I couldn’t have found a better price for a solid wood set as this was! Great buy and beautiful color! This arrived before the rest of the set that I had purchased. It is a really nice size, with ample space, I store my printer in the bottom compartment. The feet make a nice addition, and make the stand that much nicer. Overall a great purchase. "Is there a shelve dividing the lower door storage area?" Hello kiddad, the doors do not have a shelf behind them. Thank you for shopping with us. I think it will match the Metal Bed perfectly. "If I decided not to use the "feet," how tall would this nightstand be?" The stand would be 26". The feet are the corner piece plus the round foot (all in one) so if you don't use the feet, the whole thing would sit flush to the floor. I love it with the feet. "THE DRAWER IS NOT OPERATEING CORRECTLY. HOW DO I REMOVE IT? I CAN'T GET IT OUT." We apologize for the delay in answering your question. We can see that you are already being helped by customer service and hope everything works out for the best. Please feel free to contact us in the future if you will need to and we will do everything we can to answer your query as soon as possible. Thank you for shopping with us.